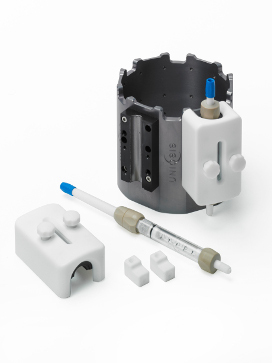 The Uniqsis FlowSyn, HotCoil and Polar Bear Plus Flow coil reactors can be adapted to accept column reactors by fitting the HotColumn™ accessory. Up to 6 column reactors may be fitted and the insulated holders are available in various sizes to accommodate, 10, 15 and 20 mm OD column reactors. A glass view window ensures that the reactor bed remains clearly visible at all times. Accurate temperature control is assured by fitting an optional external temperature probe directly into the column holder.